The steelhead is probably the fastest, strongest, and most fun fish to catch in freshwater. If you’re looking forward to a great fly fishing adventure, nothing matches being in the perfect spot waiting for that steelhead to take a strike on your fly. Dec is a master of all facets of the sport including two-handed casting, reading water, presenting flies, fly tying, and much more. He is also a master of teaching them as well. Dec has penned several articles for many American fly fishing publications. He is the author of the highly acclaimed A Passion for Steelhead published by Wild River Press. He used to be a full-time steelhead guide from 1989 to 2003 on the beautiful waters of the Skagit, Sauk, Skykomish, Grande Ronde, and Deschutes Rivers. He is also a pioneer of two-handed casting in North America and continues to be a highly sought after spey casting instructor. Dec just released a four-hour DVD entitled Steelhead Flies Tying Classics. Steelhead are genetically predisposed to go to sea. They are rainbow trout that go to sea like salmon do; they live in the water as a juvenile and then they go out to the ocean. They spend their growing years in the ocean, which is about one to three years. After that, they return to the freshwater to spawn. Steelhead don’t typically thrive on very rich aquatic rivers. However, if you look closely at some rivers that are very prolific with aquatic life, you might have a chance to see some resident trout and some steelhead. These mean fishes like to inhabit in rivers that are between 40 and 50 degrees Fahrenheit. Anything warmer than that is not good for them. And just like any other fish, they need clean and unpolluted water. Steelhead travel out to sea when they are in their smolt stage. During this stage, they usually measure eight to 10 inches and age between one to three years old. In the Pacific Northwest, they go out to sea from most of the northwest rivers when they are about one year old. A larger juvenile hits the saltwater and be able to eat larger prey, which makes it grow faster more efficiently. The bigger the juvenile is, themore efficient eating machine it becomes. When the steelhead comes back in the freshwater, it will be much bigger. The longer it stays in the ocean, the bigger fish it becomes. After the steelhead have gone back to the freshwater and spawn, they are capable to go back out into saltwater. However, not all of them make it. The rigors of spawning usually claim most of the male fish or bucks. They would hit the river early and ready to spawn and they’ll stay around through the whole spawning process with all the female steelhead. While they are here, they fight and tend to wear themselves out. Studies reveal that females are more successful in repeat spawning. When steelhead spawn, they don’t really need to feed. Their digestive system shuts down. However, this doesn’t necessarily mean that they don’t do some active feeding – they just have fat stores to carry them through while they are spawning. A steelhead basically has two runs – the winter run and the summer run. Although they all spawn in the spring, the difference is winter runs come and go faster. A summer run comes into the river from the saltwater in the late spring through summer until winter is over and then spawns in the following spring. A winter run, on the other hand, comes in during the winter months – December, January, February, and March – and spawns that immediate spring. Steelhead are primarily a Pacific Ocean fish. If you’re wondering where you can find them, The Great Lakes in the Canadian and US border offers some wonderful fly fishing opportunity. Northern California all the way up to Alaska are also good places for steelhead fishing as well as Ober and Camchaka in Russia on the other side of the Pacific. Before fishing for steelhead, Dec recommends reading a book or watch helpful videos. “There is a lot of really good information out there,” he said. However, if you don’t have enough time to read, he suggests hiring a guide instead. This would let you enjoy and do all the fishing while your guide does most of the thinking. “It’s an incredible learning experience. I don’t know any good steelhead fly fishing guides who are not really eager to not only show you water but share their passion, technique, and philosophy as well,” he concludes. 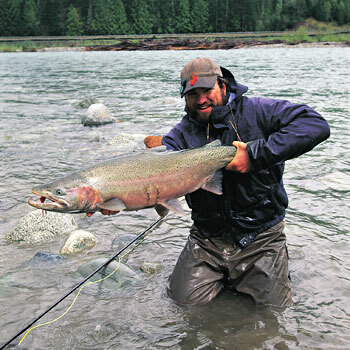 Listen to our full interview with Dec Hogan and get more tips on fly fishing steelhead.